You may wish to read a highly informative article on alternative health that appeared in a popular and respected magazine: the March 2015 issue of Scientific American. Easy to use and designed with our most recent fast nano-sec rise time truncated square wave pulse technology (creditable to NASA research). The use of pulsed magnetic therapy is recognized in Canada and Europe as a beneficial aid to many ailments, chronic pain and other health issues. NASA medical researchers have found fast rise time, high peak power, short duration pulses are more effective in PULSED MAGNETIC THERAPY. Our pulse circuitry does exactly this, generating a high peak power waveform with a fast rise time of less than 50ns. This feature also eliminates wasted power that only serves to heat up the treatment coil, yet allows higher peak power magnetic pulses to be applied to the treatment area. The TDHP40 pulsers are powerful enough for the trained therapist or researcher, and are also available for individual consumer use. Range of frequency control includes the beneficial higher frequencies up to 2500Hz, down to 1 Hz including the lower 7-8 Hz natural earth resonant frequency along with the alpha, beta, delta, theta frequencies used for sleep, dream control and relaxation states. ‡ Magnetic pulses produced electrically often contain a mixture of both NORTH and SOUTH pole directions. This is caused by circuit ringing, and decays over a period of time longer than the intended pulse duration time. Our design uses patented circuitry that nearly eliminates this undesirable effect. Additional Coils Are Available: the TDHP40BAS includes (1) PADCOIL50, but additional coils are available if the user wants to employ more coils, or larger coils. A few coil designs are listed below, otherwise please contact us for any specific requests in different coil sizes or design. For example we can make you a cylindrical tubular coil of any size for other applications, or larger flexible mats, etc. Just contact us with your size requirements and we will send you a quote. The TDHP40DEL is the deluxe version with additional features, for those who want to experiment with meditation, dream conditioning, relaxation states, out of body experiments, mind conditioning, etc. Synchronized light pulse circuitry allows for optical coordination with magnetic pulses (if desired) Includes a synchronized output signal for use with LED glasses (the LEDs are included with a connected cable and plug), the user then drills holes in some low-cost sunglasses, secures the LEDs in place with silicone rubber or equivalent for an illuminated pulse that synchronizes with the coil's magnetic pulse. Additional Coils Are Available: the TDHP40DEL includes (1) PADCOIL50, but additional coils are available if the user wants to employ more coils, or larger coils. A few coil designs are listed below, otherwise please contact us for any specific requests in different coil sizes or design. For example we can make you a cylindrical tubular coil of any size for other applications, or larger flexible mats, etc. Just contact us with your size requirements and we will send you a quote. It is suggested to go to www.magneticpulsers.com to see the many sanctioned features of our design. 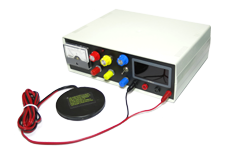 This portable, battery-powered Theramagnetic Pulse Generator produces low power magnetic pulses at 2500 repetitions per second, with a pulse rise time of approximately 10-50ns, and a coil strength of between 10-20 gauss. Each pulse contains up to 2 millijoules of magnetic energy which is believed by some to have an effect on many ailments and afflictions. This device is designed so that it can be worn in a shirt pocket, belt, or otherwise attached or easily worn concealed. Holding an aluminum can between your ear and this pulser will create a distinct ringing, as the can itself becomes the opposing polarity. Holding the coil in front of a TV will form lines on the screen of the older cathode ray type TVs from several inches away. The components come mounted on a small circuit board wired into an electric magnetic coil, powered by a 9 volt battery or by plugging in an AC adapter (not included). A rubberized coating insulates and protects the circuitry. A small switch allows the device to easily be turned on and off. Weighing less than an ounce (without battery), it can be easily enclosed within a 3.5" x 3.5" x 1.25" container if so desired (such as with a snap lid for access). A round hole can be drilled putting the powerful magnetic coil flush with the bottom for contact applications. This unit costs much less than the 115 volt Magnetic Pulsers you may be familiar with, which are normally sold for $300-500. This pulser, as sold, is non-invasive and is not yet FDA tested. We now offer the device as a fully functional product that is not housed, but is suitable for experimental testing. All New wearable shirt pocket size two part unit can be conveniently taken anywhere. Uses our Nanosec rise time as they are claimed to be more effective. Free Choice of any Plan with purchase of book where mentioned -- either type in your plans at the "special instructions" in step 4 of checkout, or contact us after you place your order and we will email your plans to you. "Effects of PEMF on Tissue Trauma" Eur. J. Surgery by Jorgensen, MD. "Electrical Treatment of Severe Head and Neck Cancer Pain" Arch. Otolaryngology Wm. Bauer, MD. "Magnetic Field Bioeffects - Synopsis of Peer-Reviewed Studies" A. Pilla, PhD. Pulsed EMF Effect Article Abstracts selected J Tom Bio-electromagnetics Journal. "Glen Gordon, MD Speaks on Pulsed EM Healing Developments". S. Allan NASA Study on Efficacy of EMFs to Stimulate Growth and Repair of Tissues (one-page summary). "A High-Voltage Fight Against Cancer" IEEE Spectrum by E. Guizzo. "Medicinal EMFs" Science News by Janet Raloff. SOTA Instrument PEMF device information sheet. Four chapters totaling 250 pages of the classic 1916 illustrated text of Sinclair Tousey, MD. Tesla coil electrotherapy includes: high frequency currents, electricity through gases, diseases of the nervous system, and phototherapy. Convenient, menu-driven PC-based format. Two added BEMs slide shows as a bonus. Narrated BEM Healing PowerPoint slide show by Dr. Thomas Valone. Complete 84-page BEM Healing book - same as printed softcover edition by Valone. NASA 33-page study on nerve repair cited on Dr. Glen Gordon's www.em-probe.com website. "Biofield & Bioinformation" J. of Alt. & Comp. Med. by Dr. Glen Rein. "Chronic Fatigue Syndrome and Bio-electromagnetics" by Dr. Thomas Valone. "History of Electromedicine" by Dr. Thomas Valone. Analog to the EEG, the brain's MEGs are 1000 times less energetic but can be measured with non-cryogenic instrumentation. Simple designs can easily be commercialized. 24 pages. In the 1980s he documented the transmutation of elements and the creation of amino acids from basic electrolytes. This year Japanese scientists are working to replicate many of his research and experiments. 30 pages. E or M waves (ELF) and RF) affect the organs, nerves, behavior, histamine, calcium, and EEG. With over 600 references, two data bases of complete titles and citations. 44 pages. The first book to provide a comprehensive, scientific explanations for the reasons why high voltage electrotherapy devices work. Includes a summary of the new findings of bio-photons. 90 pages. This massive book, the thickest in our entire catalog, is comprehensively organized in seven chapters giving the most informed choices in natural nutrition into and beyond the 21st Century. The world's most comprehensive super-book on natural healing, there is information on 90 vitamins, 100 minerals, 55 protein amino acids, 450 power foods and 900 herbal healing plants. Other chapters are on body and brain anti-aging and conditions and cures, including 1,600 degenerative diseases and hundreds of toxins. This giant book has a bibliography of wholistic sources and a comprehensive index for unlimited health solutions anytime. 1489 pages in a 6x9 paperback with index. One of the few books on Dr. Royal Raymond Rife, 1920s scientist, inventor, innovator, researcher, humanitarian; betrayed and persecuted by the people he tried to help. Rife was determined to study micro-organisms in a live state. Since there were no microscopes capable of this requirement, Rife set out to design and construct such a microscope. After years of optical studies, followed by years of design and development, Rife was to produce such an instrument. He called it the Universal Microscope. Rife went on to develop a unique method of destroying disease-causing organisms by electronically-induced frequency generation. Had Rife discovered the ultimate weapon against diseases in mankind? This handy, user-friendly compilation offers tried and true suggestions that tie in with humankind's innate common sense and the need to become more self-reliant in today's ever-changing world. Includes Natural Disaster guides; First Aid guides; Preparedness and Prevention guides; Social and Spiritual guides; checklists where necessary; plus sources, bibliography and where to get further information. The appendix includes government and IRS forms relating to disaster and injury claims. 135 pages in a 9x12 paperback fully illustrated. Modern Meditation: Science and Shortcuts offers the most direct method today for learning the modern technique for easily learning meditation in four easy steps. With four basic exercises that anyone can learn quickly, this book provides the best and easiest path to the achievement of a new and improved you! With lots of science references, studies prove the long-lasting effects of the practice of modern meditation in a simple fifteen-minute exercise. Benefits include greater orderliness of brain functioning, improved ability to focus, increased creativity, deeper level of relaxation, improved perception and memory, development of intelligence, natural changes in breathing patterns, decrease in stress hormone, lower blood pressure for hypertensive people and a normalization of blood pressure for low blood pressure people, reversal of the aging process, reduced need for medical care, reduction in cholesterol, increased self-actualization, increased strength of self-concept, decreased cigarette, alcohol, and drug abuse, increased productivity and hearing ability, improved relations at work, improved health and longevity, more positive health habits. 110 pages, illustrated.